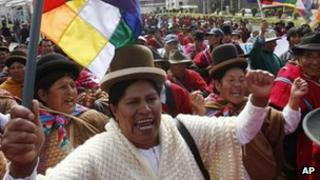 Bolivia has passed a controversial law which paves the way for President Evo Morales to be elected for a third time. The Bolivian constitution states that presidents can only serve two terms. But Bolivia's highest court ruled last month that, because the constitution was changed during Mr Morales' first four years, that term did not count. Opposition politicians say that the law is unconstitutional and that they will try to get it overturned. The law was signed by Bolivia's Vice President, Alvaro Garcia Linera, as Mr Morales is out of the country. "He has the constitutional right to choose to be re-elected," Mr Garcia Linera said in Bolivia's main city, La Paz. Mr Morales became Bolivia's first indigenous president in 2006. He was re-elected by a landslide in 2009, after changing the constitution. But the country's highest court, the Constitutional Tribunal, ruled in April that the two-term constitutional rule did not apply to Mr Morales' initial term because it had taken place before the new constitution came into effect. Opposition politicians have however pointed out that, under the previous constitution, only one re-election was allowed as well. Mr Morales still enjoys strong support among poor and indigenous Bolivians. New elections are due next year, but the president has not said whether he intends to run again. Political analyst Maria Teresa Zegada told El Pais newspaper that "it is clear that the will of the MAS (Movement Towards Socialism, Bolivia's governing party) is to remain in power and opt for the re-election of Evo Morales". The president's critics have accused him of using the courts to hold onto power indefinitely.